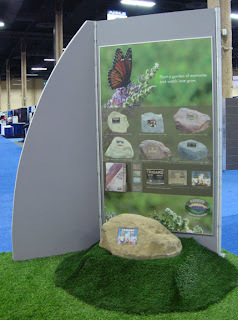 The 2012 ICCFA Convention marked another big event for Trigard - the release of our new memorial rocks. Our new lightweight rocks are crafted from molds based on natural rocks. They are available in six styles and three colors, and can be customized with a bronze plaque in either oxide or full-color Brilliant Impressions. Whether the family decides to place cremated remains inside a compartment in the rock or dedicate a space in their loved one's honor after burial or scattering, our new memorial rocks provide a lasting tribute to the families you serve. Find out more or call Trigard Memorials at 800.798.4900 to order.